A deliciously fresh and fruity salad with a little hit of hot. 1. Rinse the rice in a sieve. Tip into a medium saucepan and cover generously with water. Salt lightly and bring to the boil, reduce the heat to a gentle simmer, cover and cook for 25-30 minutes, until just tender. Drain well. 2. Meanwhile, put ½ a papaya and ½ tsp of its black seeds in a blender with the olive oil, garlic, thyme, lemon juice, mustard and 1 tbsp water. Whizz at high speed to make a smooth dressing; season. Finely slice the remaining papaya, discarding the remaining seeds, and set aside. 3. Place a large, non-stick frying pan over a high heat and add ½ the halloumi in a single layer. Cook for 1-2 minutes on each side until well browned, turning with tongs. 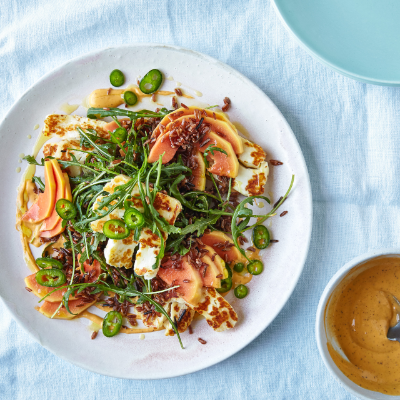 Transfer to a plate and repeat with the remaining halloumi. Toss the rocket and rice with ½ the dressing in a mixing bowl. Add the sliced papaya and halloumi, toss again then serve, topped with a drizzle of the remaining dressing and a scattering of the chilli.